Santa Caterina, Italy – The Audi FIS Ski World Cup circuit resumed Tuesday with a make-up super G on a steep, dark and challenging course in Santa Caterina. Originally scheduled for rolling slopes of Lake Louise, Canada, Santa Caterina picked up the event ahead of Wednesday’s downhill and Thursday’s alpine combined, challenging the field with the most technical track of the season so far. 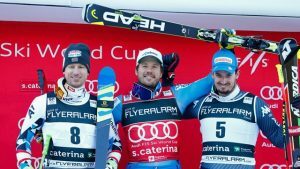 Norway’s Kjetil Jansrud won his 18th World Cup race by more than a half second over Austria’s Hannes Reichelt, who finished second. It was Jansrud’s third-straight super G victory this season. Starting with bib number 5, Italy’s Dominik Paris was the first to lay down a strong run and set a reference time of 1:31.53. After his third place in the super G in Val d’Isère, Paris was a serious contender and the pressure from the Italian crowd was palpable. In the end, Paris finished third for his second podium result. Tommy Biesemeyer, of Keene, N.Y., posted a career-best eighth-place finish to lead five Americans into the top 30. American Bryce Bennett, of Squaw Valley, Calif., scored the first World Cup super G points of his career in 20th place, from the 60th start position. Other American finishers included Andrew Weibrecht (Lake Placid, N.Y.) in 12th; Travis Ganong (Squaw Valley, Calif.) 24th; Jared Goldberg (Holladay, Utah) 30th; and Ryan Cochran-Siegle (Starksboro, Vt.) 33rd. “The course is just dark from top to bottom. There is a little bit of light in the middle on the flat parts … it’s tough, it’s all there. It’s actually our toughest course on the tour just because of the way they prepare the snow and the darkness,” said Weibrecht, who was stoked with his finish following last week’s disappointing results and a sprained ankle a few days ago. Up next, the men race downhill Wednesday in Santa Caterina, where windy weather is in the forecast.